Despite the metaphoric ringing of the bell to signal the end of the transfer window, Roma’s real mercato is only just starting. Roma rebounded from a tough defeat away to Lecce by emerging victorious over an Udinese side also battling for a Champions League place. Roma Journal looks at five things we learnt about Luis Enrique’s side in their critical 3-1 win. What a game. What a glorious, glorious game. 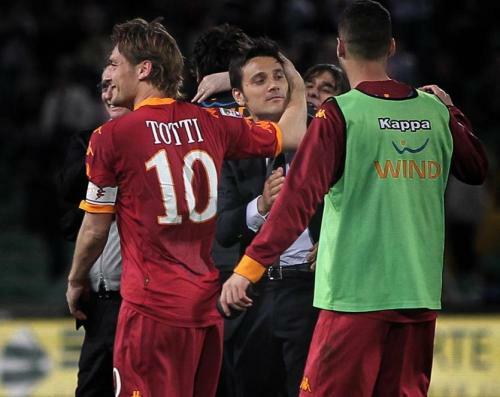 April 2nd 2012: Charity Match and Tanti Auguri A…. Roma travelled to the Stadio Giuseppe Meazza on Saturday evening to face Milan, a trip that had yielded four victories in the previous five league games against the Rossoneri. Roma have signed an agreement with the Policlinico Universitario Campus Bio-Medico to provide better treatment for the first team, youth teams and staff. The hospital is located close to the training ground at Trigoria, and will allow the club’s personnel to receive highly specialised care as well as diagnostic tests. Can Roma’s captain adapt to Luis Enrique’s style of football, given his age and commercial abilities? Here’s a short news roundup for Wednesday March 21. Expect at least one of these per day as the site gets launched officially.